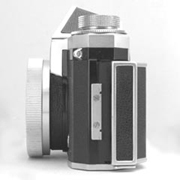 The second generation of Praktina cameras was marked out from the lack of the mechanism to close automatically the diaphragm of the SB lenses and from the lack of the coaxial contact for bulb flash units, present in the previous model DS. 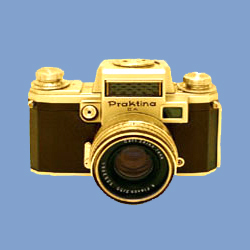 The version 1 has the half-size camera back hooking while the version 2 has the full-size camera back hooking. 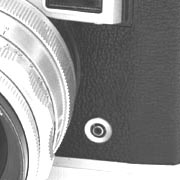 Moreover in the version 1 the wind and rewind knobs are knurled with 6 diamond rings while in the version 2 with 5 diamond rings. The previous model code "FX", version 1 and 2, has been changed in "FX-M", version 1 and 2. 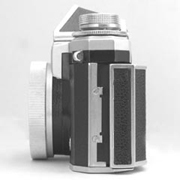 As from 1955 the Kamera-Werke was able to supply the complete set of accessories including eyelevel finder, waist-level finder, high-magnification finder, bellows focusing attachment, macro rings, filters, lens hoods, electric motor, spring motor, 17m magazine back, stereo viewfinder and lenses from Carl Zeiss Jena and Meyer-Optic Görlitz in the range 35-500 mm. 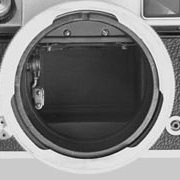 • Lens diaphragm control: none.